I have admired Terry's work from the first moment I saw one of his 'Manta' pieces. I was amazed that what he created had once been a piece of wood; it seemed unimaginable. It still astounds me how Terry's pieces continue to evolve and how he continues to push the boundaries of his imagination, whilst still producing pieces of the highest calibre. I find it incredible how he can produce these wonderful forms while still managing to have a full-time career and family. Terry started by telling me about his background; this seemed to me like the logical starting point. I asked Terry when turning began to feature in his life: "My wife will tell you that I was in love with wood long before I fell in love with her. At 17, I began my career as an apprentice builder. It was at the same time my Grandfather resurrected an old lathe thinking that I would like to turn, as well as hammer wood," he tells me. faceplate screwed to the pulley; the lathe was left to gather dust in the back of his shed. Terry goes on to tell me how, unfortunately, other priorities took over: earning a living, marriage, boat building, running numerous business ventures, children, and so on. In terms of his inspirations, Terry cites many, including the beauty and potential of wood: "It has always drawn me," says Terry. "I love the bush and the smell of it after the rain. I love the wonder of walking under a canopy as light dapples through the leaves. 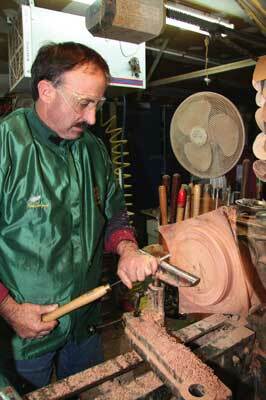 I guess it was only a matter of time before I would be drawn into the woodturning fraternity." Terry goes on to recount some memories, which involve him clearing an ancient, rotting puriri tree for fire wood from his property: "An elderly gentleman approached and sternly reprimanded me, asking how I could burn down such beautiful dense and valuable turning timber." The conversation continued and Terry was invited to attend the South Auckland woodturners guild to see what his timber could really be used for. The rest, according to Terry, is history. The wise and talented men within the guild nurtured Terry's talent and he soon became friends with many of them, enabling him to "wake the sleeping giant within." 12 years on and Terry's love affair continues: "I still get the immeasurable pleasure from creating an infinite variety of turned pieces to share with those like-minded individuals who also appreciate the beauty and skill involved when one enhances Mother Nature's treasures," he says. 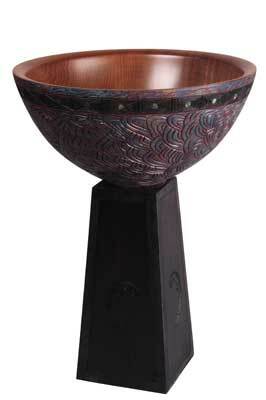 Terry finds that his skills and appreciation of form and finish have matured over the years, as have his pieces: "Every work I make I critique, even if it is a simple bowl. I also welcome others' input; it's amazing how we can all learn from a beginner or professional, alike." Terry goes on to tell me how his progression is due to entering many shows and competitions, which are all available to turners in New Zealand: "The learning curve is immense when your work is sitting amongst others that you may compare and personally judge against your own." Because Terry has been fortunate enough to keep woodturning as his hobby this has enabled him to experiment and to push his personal boundaries, and this in itself has allowed Terry to become a diverse participant in the craft that is woodturning. When questioned about his workshop, Terry tells me there is a sign as you walk in the door, which says: "Those who are organised are too lazy to look for anything." "As I am working on five or sometimes six artistic pieces at one time my workshop always looks like it's in chaos, or a burglar has visited, pulling everything out and scattering it around," says Terry. Terry built a large shed years ago away from his house, but he has never moved as he finds it is so convenient to walk through the kitchen into the double garage that serves as his workshop. "If I had any more room I'd just fill it with tools and machinery. 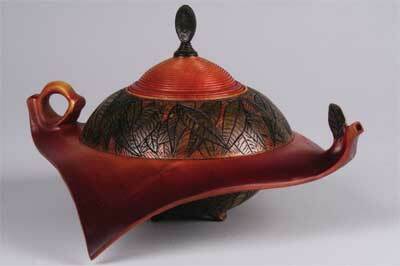 Plus, it is handy to go grab those things all woodturners need from the kitchen." Terry finds that this helps him keep his "toolaholic" addiction somewhat in check. Having his workshop in such close proximity is perfect for him as he does most of his turning at night. "On a wet night I probably wouldn't walk down to the shed. The barn has now been converted to a stable, tack room, gallery, and a very large wood storage area," Terry tells me. When I asked Terry about his work ethos I did not find his response surprising: "Coming from a long line of workaholics I have always been driven. 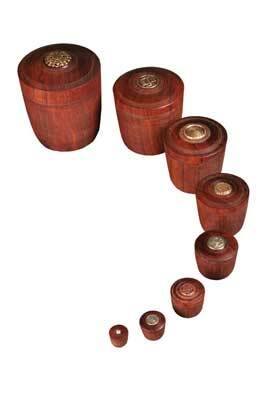 This drive has always placed that need to achieve or to compete, whether in business, family or woodturning. It has been noted that I don't do things by halves. Vic Wood once commented that I don't hesitate â€“ I just get in boots and all. 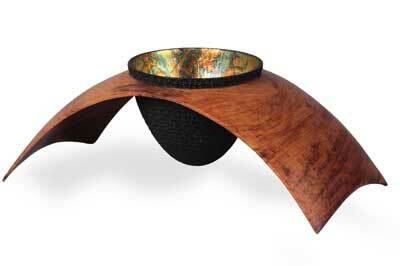 The challenge and learning curve that woodturning offers satisfies an itch." Terry says that if he had been asked 12 years ago if he had an artistic bent he would have laughed: "Now I revel in creating and trying new ideas," he says. I asked Terry to explain his style and type of work to me â€“ a question that is sometimes not easily answered. Terry seems to have a firm grasp on what he wants to achieve before he even sets out: "Having progressed from an "evolve-ist" (someone who starts turning and the wood dictates the shape or design) to a "vision-ist" (I can see the finished work before I start) yes, it is quite scary." Terry tells me that he is continually looking around at shapes and textures in nature. "I don't, or cannot sketch, so I have learnt to hide these away in the grey matter for use at a later date," he finishes. He explains that many of his works are "follow-ons" from the previous piece, although looking at them you would never believe this. A grain pattern or a texture may spark another work: "In many of my works there is a challenge, especially in pieces like my winged vessels. I also like it when people ask me if they are really made of wood," says Terry. I was interested to hear about the high points of Terry's career so far, as well as the lows. Terry tells me how selling his first piece was definitely a high point: "Thinking that I had made something that someone would want to buy was a great feeling. Becoming a proficient demonstrator is also a great achievement." It is great to see that Terry also has a well-earned respect for his woodturning peers: "Working alongside the gods of woodturning," as Terry calls it. There seem to have been many high points in Terry's career and he seems to take pleasure from a variety of elements, such as teaching, demonstrating and selling his work. His positivity and drive are very clear for all to see: "Teaching someone new to turning and seeing the delight and smile on their face gives me a great buzz every time. Often, I go home and turn something straight afterwards â€“ their excitement rubs off onto me." 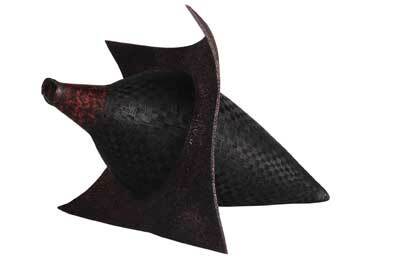 In terms of lows however, Terry hardly seems to have any at all, which goes on to affirm his love of turning. "If I run out of steam my hobby allows me to walk away for sometimes days, sometimes weeks, until I have re-charged my batteries. These are in reality the only lows when I don't wish to turn anything," he says. knew this would be a difficult question for Terry to answer, but it was one that I was especially interested in discovering the answer to. I asked him what his favourite thing about turning was, to which he replied: "That sweet sound and satisfaction when the chisel is cutting and the shavings are flying. What a stress relief from work! Sometimes I just get a big chunk of wood and turn it down to a miniature goblet. I get the same feeling as if I were sailing along on a starry night with not a care in the world." Terry finds he has made many contacts through his business, as well as through friends and acquaintances, all of which are great ways for him to promote himself. "If the subject of my turning comes up, I self promote. I hand out many hundreds of cards and encourage people to look at the new website." In addition to this, Terry enters many competitions to help promote his turning. "I have tried advertising in local papers but have found word of mouth is by far the best method to use." Lastly, I took the opportunity to ask where Terry thought his turning career was going - an interesting question according to Terry: "As long as I am learning new skills and am able to pass on what others have taught me, I will be happy." Terry longs to create the perfect piece, but he doesn't see this happening. He says he will continue to keep heading in that direction and keep trying. It was a great pleasure talking to Terry and getting a feel for his work ethos and aspirations. It is clear to see why he is such an internationally respected turner. I wish him all the best for his future career, which I'm sure will yield many more successes. For more examples of Terry's work, see website details opposite. Cyanoacrylate – it gives me hell!